A goalie drill for this week. Players start in the corner. There is a small bumper or barrier that is placed halfway between the dots and the post with part of it overlapping the goal line. Players skate out of the corner straight at the barrier and then move left or right and attack the net. If they move up ice (away from the goal line) they should look to take a quick shot. If the move below the goal line the play is a tight stuff on the post. To add a degree of difficulty, the player can also wrap to the far side low or walk across the crease high. 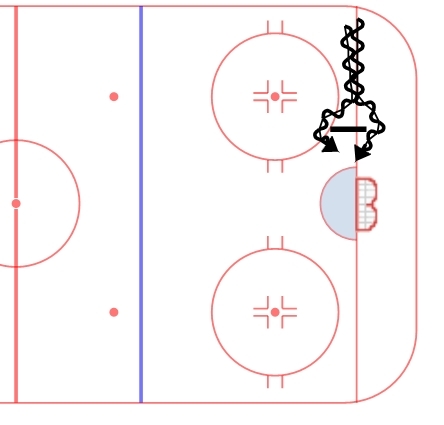 This drill is to simulate players walking out of the corner and making tight plays to the net. Goalies may use a variety of post-integration techniques to play this situation. Personally, I would advocate for a tight lean with a great post seal. This allows the goalie to easily move off the line on a walk out or a wrap, while also sealing the short side in the event of a stuff. Critical to any post-integration technique is proper execution. Goalies must ensure they have a tight seal on the post with their body and pad.